The Industrious Hygienist has been ridiculously busy over the last few weeks making new puppets and manga (and still working three jobs). To help tide you over until the more educational and interesting posts, here's a 2015 holiday greeting for Easter - or the spring/fertility festival of your choice. 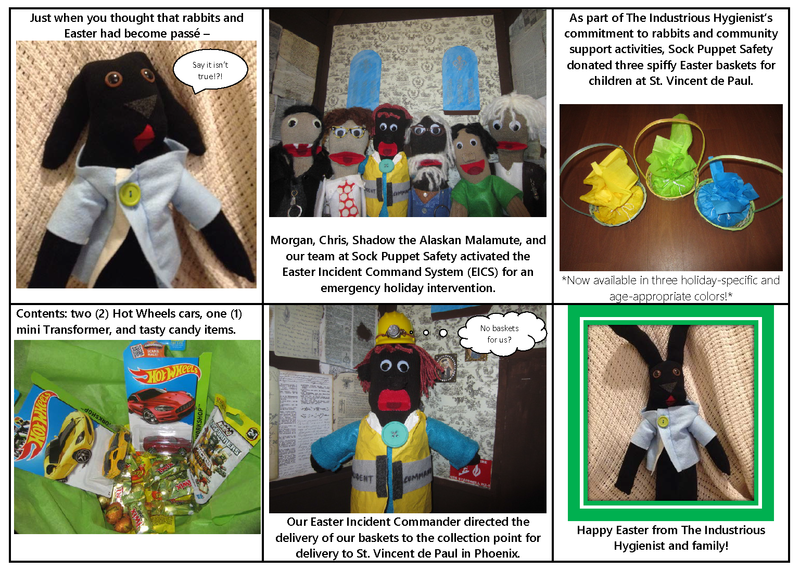 Attempting to make Easter enjoyable as an adult - brought to you by Sock Puppet Safety. Upcoming blog posts include: writing a tabletop disaster drill scenario with Master Scenario Events List (MSEL), Code Pink shenanigans, why every manager should be trained in incident command, and completing an After Action Report (AAR).